These notes on non-verbal ‘Orders’ that are sometimes given by means of the taiko (drumbeat) or the wooden hyōshigi (signalling billets of hardwood) are based mainly on my own experiences in a very limited number of ko-budō dōjō in Japan, and, more reliably, in personal teaching initially by both Harry Russell-Robinson (The Royal Armouries) through the late-1950s to the 1970s, and Dr. Benjamin Hazard, late-Professor of Japanese and Korean History, in California, both acknowledged authorities on Japanese culture and military history, as well as a number of senior high-ranking kodansha in Japan. From the outset it is important to understand the origins of these signals in practical terms. On the one side they developed from the importance of gaining the support of the martial deities in battle, both before, during, and after conflict; on the other is the pressing need for orders to be heard by one’s fighting men and immediately acted upon despite the fierce din of violent conflict. The latter comment applies universally, of course, but the former reason was equally present until only a century or two ago and still survives in the Bugei. Focussing on ancient and medieval Japan, the drum’s significance was that it was used to attract the attention, and therefore, the patronage/support of one or other of the martial or tutelary deities, in time of dangerous enterprise. Simply stated, the taiko’s deep ‘voice’ was not merely a penetrating sound, it was the ‘actual Voice of the Deity’ on the battlefield. This can be traced clearly back to origins in Central Asia which I won’t elaborate on here. It was only comparatively recently that the drum’s presence in the dōjō has widely become ornamental and vaguely ceremonial. However, proper Japanese drums are a very expensive item indeed and, often depending on their size, only to be obtained from specialist makers, or from China and re-furnished and correctly lacquered. The huge taiko used by the contending clans in the period before the Tokugawa gained power after the Battle of Sekigahara in 1600, are rare, indeed, and while some do doubtless survive, I only know of one enormous example that is said to have belonged to the Regent (Taikō), Toyotomi Hideyoshi (d. 1598) and is now housed in the Saineikan Dōjō in the Imperial Palace, Tokyo. My first Kendo renshū in Japan was in that dōjō back in 1967, by the way. And I can still remember the sound of its voice today. For the purposes of this article, I shall use a simple ‘beat notation’ rather than a complex verbal description. A short beat will be shown as ‘o’ or a series of beats (not a drum-roll) as ‘o o o o o . . .’ A strong, spaced, beat or series of beats, as: ‘O O O O O . . . ‘ Very strong beats as: ‘O O O O O . . .’An extra strong (forceful) terminal beat ‘O’ usually reinforces orders at the end – (just to make sure the deaf students really understand)! The opening and closing beats, on very formal occasions only, I must emphasise, are to ‘invite’ the deity to be present or to leave at the end. The deity will sit inside the drum which will be his ‘horse’ during the proceedings. (This custom appears to originate from ancient Shintō ritual, according to one of my sources, Yahagi-sensei, a senior ritualist at the great Kashima Shrine). 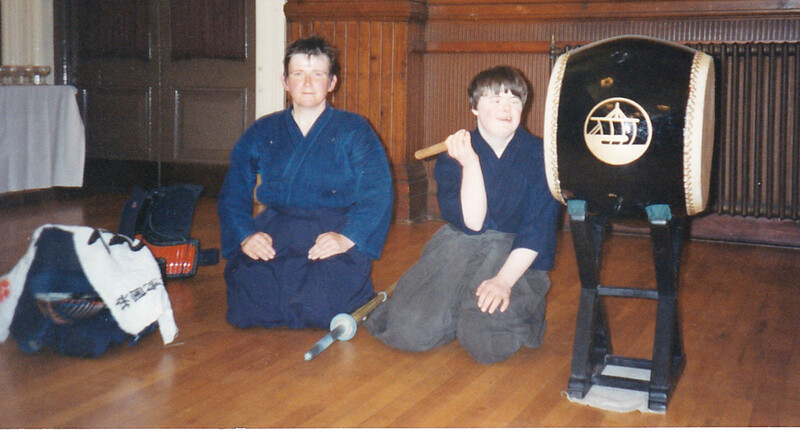 This formal drumming is always performed from full seiza with a full bow (rei) at the beginning and end. Commands are usually given standing by the Sensei or the Sempai, depending on the particular training, or the designated lower yudansha. o o o o o o O O O O O O O O O o o o o o o O. Often, but not specifically, the tempo of the minor ‘beats’ are varied in speed/interval from slower or faster, the latter are given more emphatically. Students of all ranks, in Kendō, would be expected to immediately go to their formal start line and assume seiza-no-kamae but await any further orders. o o o o O O O – O (note the time pause). Variations and additions remain obscured by custom in each dōjō and depend on the sensei. There must have been many as drumming and the employment of the Hyōshigi ordered many aspects of the warrior’s daily life, the Bugei-dōjō probably being one of the strictest areas preserving these traditional customs. I have a recording on tape, given me back in 1976 at Kashima-jingu, of the range of signals used in battle by the great Takeda Clan, dating from well before the 15th or 16th century’. These were sounded on the hora, or Conch shell horn. Throughout the Japanese medieval period signalling by conch shells (horagai), flags and banners (hata), and drum (taiko) were common – alas, now mostly lost to modernity. The recording that I have was made in Sendai in the Tohoku, the Sendai family being the one of the survivors of the Takeda-ke. My first Iai master, Takami Taizō-sensei, descended from a very high-ranking warrior family serving the Nanbu-han in Tohoku. Unfortunately, he didn’t talk about this aspect of the tradition because they, too, were a cadet-branch of the mighty Takeda. My experience was at first-hand and certainly, in the case of instruction by Takami-sensei, only at one generation removed. The widespread use and application of drumming is to be found all over Japan although, all too often it has been passed down aurally in the various traditions. Drumming accompanies prayer chanting and many rituals in Shingon Buddhism and in the closely allied Shugendō. These drumming sequences are of great interest and often extremely complex and prolonged. I witnessed one at the great temple at Yoshino-yama a few years ago and made many notes. The purpose of the event was the ‘feeding of one of the Shugendō minor deities’. Throughout the ceremony a junior priest chanted in a low rising and falling tempo accompanied by drum beat – twenty minutes of it without a pause or break!I also have recordings privately made at a famous Buddhist temple in Kyoto of complex drumming. Then there is the again complex drumming (and music) that is employed in Shintō ceremonial. I would stress this sort of drumming is nothing like the popular Taiko performances that are seen on TV from time to time, although related in some ways. However, the martial roots and this latter drumming indicate that these customs may have originated many centuries ago, possibly well before the Eighth century. In this they are related to the use of folk dance to ‘entertain’ the important deities whose support was so important to life, itself.